Larkin and Tipp's Brendan Maher: there was no quarter asked or given in last year's All-Ireland final. 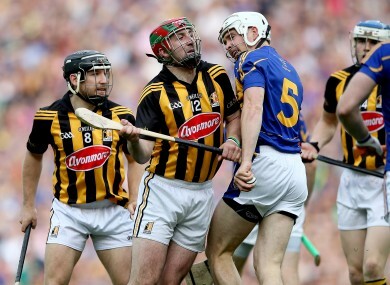 SOFT RED CARDS are becoming a hurling headache, according to Kilkenny ace Eoin Larkin. The Allstar forward blames the GAA rule-makers, rather than the referees, for a “frustrating” rise in disciplinary offences. Larkin vented on Twitter after the provincial clashes between Clare and Limerick, Carlow and Antrim, and Laois and Westmeath produced five red cards on the same afternoon. Absolute joke @Tellytobin gets a 1 match ban for that even after an appeal.we won't be allowed have hurls playin shortly. “It’s frustrating to see,” Larkin said after helping the Cats to a crushing 24-point win over Wexford. “When I was growing up it was a serious talking point for any man to get sent off. To see a red card in a game, it was an horrendous blow. Now it just seems that the way it’s going. “It’s obviously not the fault of referees. It’s just frustrating. There were no such problems in Nowlan Park on Sunday as Larkin and Kilkenny ran riot and booked their return to the Leinster final. Referee Diarmuid Kirwan showed just a single yellow card in a game high on scores — predominantly Kilkenny ones — and low on controversy. Galway await in the Leinster final on 5 June and while Larkin didn’t see their 20-point win against Laois, he knows to expect a fierce test. “They’re impressive. Their forwards are doing well and their backs are coming up with scores as well so we’ll have our work cut out in two weeks’ time. They’re a serious team and the big question about Galway over the last couple of years was that could they repeat a performance after a good performance. Email “'When I was growing up, it was a serious talking point for any man to get sent off'”. Feedback on “'When I was growing up, it was a serious talking point for any man to get sent off'”.